Designer rugs are a great way to personalise the area we inhabit. Contemporary rugs can be bold and colourful, calm and cosy, natural or handmade and even waterproof. With all this choice available, it can be hard to decide which floor rug is right for you and your home. 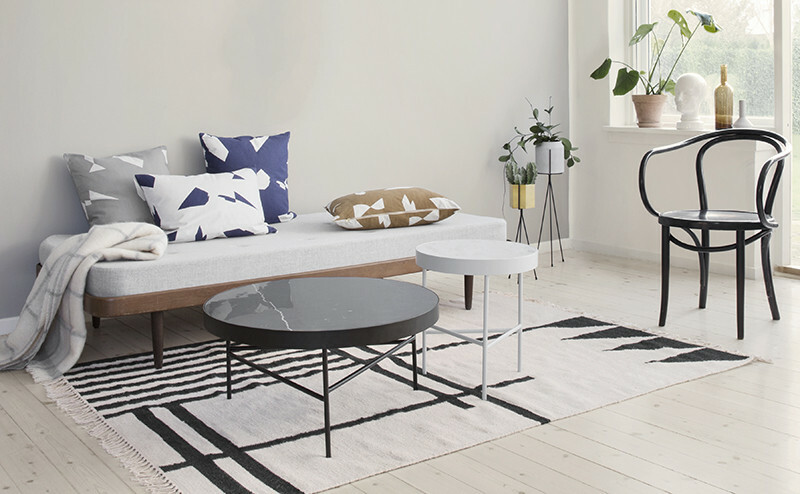 The type of rug you choose will depend on a number of options – from taste to practicality – and our Rug Buying Guide aims to guide you through many of these. So sit back, relax, and let us help you find the perfect rug. The first thing to consider when buying a new rug is what’s going to work for you, your family, and your space. Rugs are exceptionally versatile and can satisfy a number of needs – from simple decoration to defining areas within your home. Before you start to look for a new rug it is important to have in mind exactly why you are looking and what the main purpose of the rug will be. In many cases, this will be for aesthetic purposes, but for some, this might take on an extra, more practical need. To help you decide exactly what you’re looking for, we’ve highlighted the most common uses for rugs in modern homes today. If you are searching for a rug purely on its aesthetic merit, then the options available to you are plenty! There are so many styles, colours, patterns and even textures to choose from. If you are finding it hard to decide, start by thinking about what kind of shape you’d like – this can be something traditional like circular, rectangular or square, or something more contemporary, like cross-shaped or off-round. Secondly, have a think about style. Are you looking for something traditional or modern? Something colourful or something more subdued? Finally, have a think about the material you would like. If you’re a fan of cosy interiors, you may like a wool rug. Or if you prefer something less luxurious you might like a woven paper rug. With a vast array of options available, take the time out to write down what you would like as this will help you decide what’s right for you. Hard floors might look beautiful, but they can often throw up a number of issues - such as noisy footsteps and loss of heat. They can also be hazardous if you have a little one running around. A cosy, deep-pile luxury rug will help overcome these issues and allow you to keep the floor that you love. Rugs also can protect areas where there is heavy traffic. Areas such as hallways and landings are used so often that carpets can often wear out quickly, tiles can get scratched and wooden floors become worn. Investing in a rug will ensure the flooring underneath is protected from all marks, scratches and general wear and tear. Paper rugs and runners are a particularly good choice for this area as they are excellent value, hard-wearing and can be easily moved around and cleaned with a damp cloth. Open-plan living areas really benefit from the use of a rug – it helps to divide up separate areas without the use of walls or screens, and can help add a sense of cosiness to a large space. Invest in an area rug large enough to cover the area of your sofa and beyond to really separate the space. Now you know what you’d like from your new rug, have a think about where it will be placed as this can often bring up further points to consider. If your new rug is destined for the kitchen, stain resistance might be important and if it is in a sunny front room then it might need to be protected against direct sunlight. Really think hard about the room in which it will be placed to get a good idea of what you need from your purchase. Now you know what it is you are looking for, you can start to think about style and colour! Nest stock a wide variety of modern rugs in a large number of colours and styles. 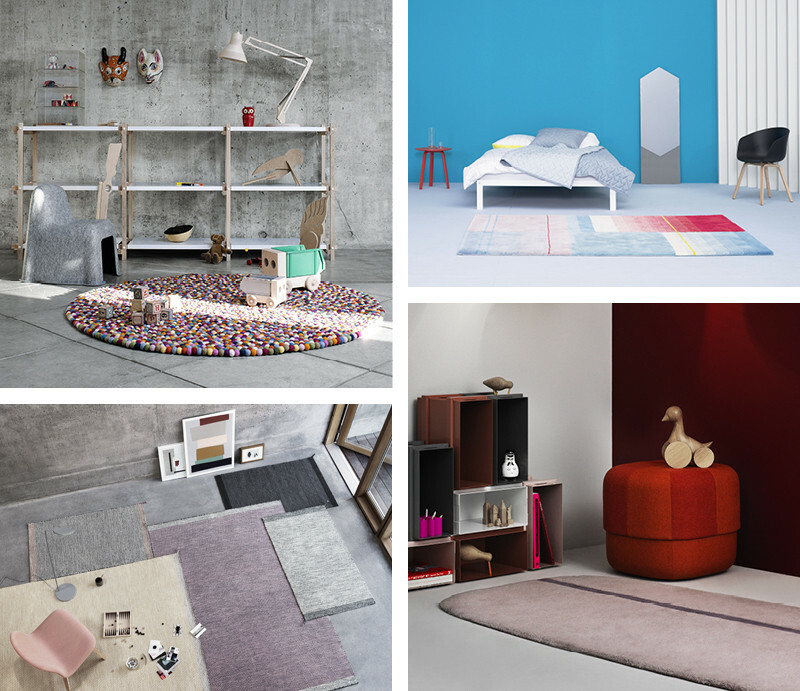 If you are a modern-lover, we have contemporary designs from HAY, SCP and Normann Copenhagen. These often have vibrant colours and graphic, abstract patterns which are ideally suited to modern living rooms and children’s playrooms. We love the HAY Pinocchio Rug for children’s bedrooms and the HAY Colour Carpet collection for graphic bursts of colour. If you like traditional colours and patterns, nanimarquina may be for you. 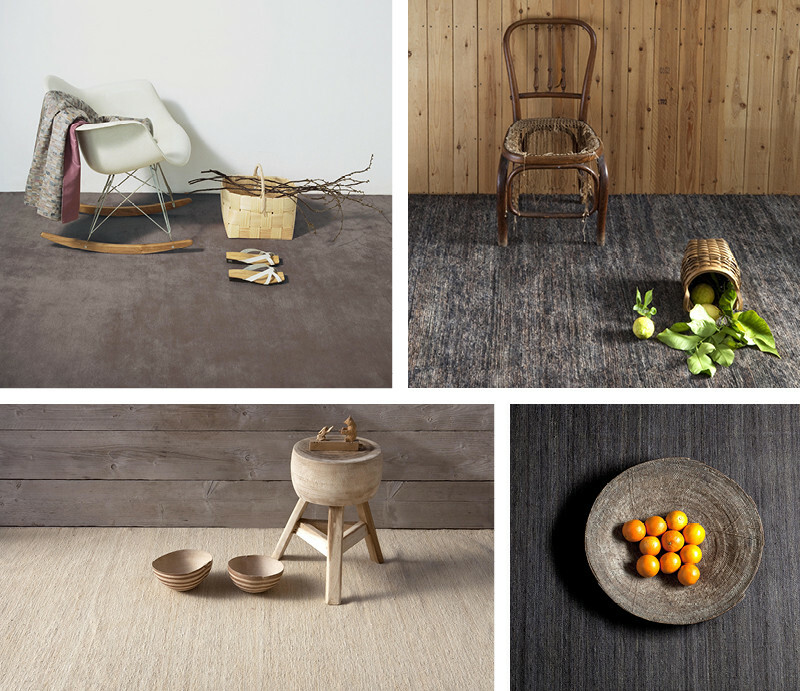 Established in 1987, nanimarquina provide exceptional quality rugs in a series of neutral shades and tones which are perfect for adding a subtle hint of colour to a bedroom, dining area or hallway. 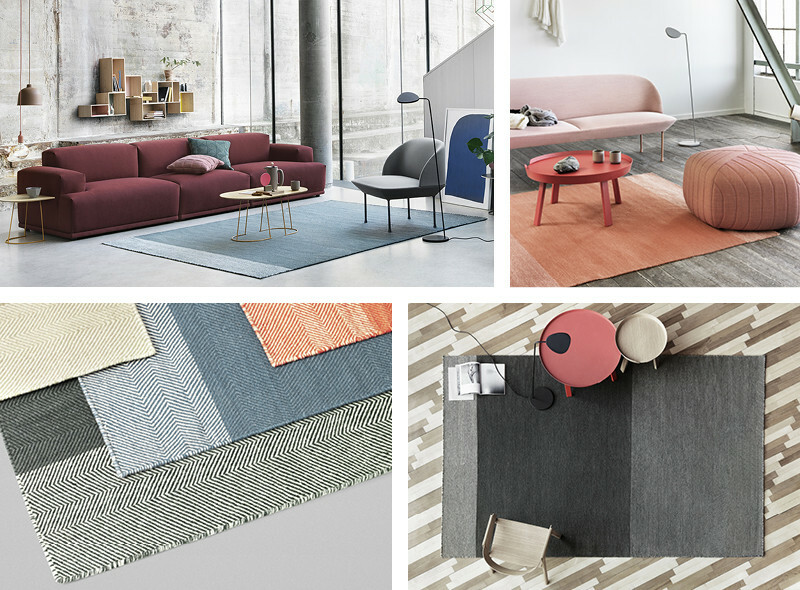 If, however, you sit somewhere in between contemporary and traditional, then take a look at GAN who produce quality design-led rugs to suit all homes and budgets. GAN only use 100% pure new wool in their designs, and all are handmade by textile specialists in India. We adore the shades of their latest collection, Silai. The quality of a rug is measured first and foremost by the material it is made of. Wool is the most popular choice and over 80% of our collection is made from this material. Wool rugs offer numerous advantages – not only is it a natural fibre that offers comfort and warmth, it is also hard-wearing, fire resistant, dirt repellent and a sound insulator. There are numerous types of wool available - including pure new wool and New Zealand wool and there are subtle differences between them. Pure new wool refers to hair that has been obtained from a sheep or lamb that has never been spun into yarn or any finished product before. It represents only 5% of world fibre production worldwide and is a luxury commodity. New Zealand wool is grown in open pasture land following sustainable land use and animal-friendly practices and is natural, renewable and biodegradable. As an alternative to wool, woven paper is an excellent choice for modern homes – especially in high traffic areas such as hallways. The tightly woven fibres ensure it is durable and hard wearing, and the coating applied to it allows it to be simply wiped-clean when needed. HAY stock a wonderful array of woven paper carpets and runner – including the Paper Carpet and Two Ways Rug. The best way of keeping your rug in tip-top condition will depend heavily upon its material, so be sure to check the label for specific care instructions. However, there are a few rules that apply to almost all new rugs. First and foremost, remember to turn your rug often as this will not only ensure even wear, it will also keep it moth free. This applies to all rugs, no matter its material. Secondly, if you have a wool rug, lightly vacuuming it on a regular basis will help keep on top of the natural shedding process and will keep it looking fresh and fluff-free. Thirdly, always remember to place an anti-slip pad under your rug. This will keep it in place and will stop it sliding around and getting dirty unnecessarily. These are available in a number of sizes and styles, but we recommend choosing a full-length polythene matt which should cover the entire underside of your rug. Finally, never pull loose threads. If you do spot a loose thread on your new rug, always ensure you snip it off at the base as this will prevent unravelling. When shopping for your rug you may come across certain terms such as ‘hand tufted’ or ‘kilim’ – these terms may sound fancy, but they just refer to the method that has been used to make them. To make it easier, we have included a thorough definition of the most common terms you may come across. We hope you find it useful. This refers to the length of the fibre protruding from the base of the rug. As a general rule, the deeper the pile, the more luxurious your rug will feel. These are the threads used to form the base of the rug; the warp runs lengthwise, and the weft crosswise. This is a manual way of producing a rug and is carried out with the aid of a pistol-like device. When actuated, it fires and then cuts a portion of the wool, inserting it into a cotton cloth base, on which the pattern has been previously marked. The wool is fixed to the base by means of latex. It allows elaborate designs but not precise, curved ones. The hand-knotted system is a completely manual one in which the wool is strongly attached to the base by means of a knot. The value and durability of the rug increase with the number of knots. The hand-loomed system uses a manually actuated loom. It consists of a device that allows the insertion and extraction of rods that fix the height of the pile. This method only permits simple designs. This technique, originally from West Asia, uses a manual loom to manufacture fabrics that mix bright, thin sections of colour to create distinctive geometric motifs. The result is a hair-free, hand-knotted fabric. If you would like further advice, or would just like to talk to one of our team about any of our rugs featured in our guide, give us a call on 0114 243 3000 or email us at info@nest.co.uk. Alternatively, you can shop our entire rug collection online.